When Lori Anderson of Pretty Things suggested a blog hop to honor someone important in our lives I was all for it. I didn't have to think very hard to come up with the person that I wanted to honor. My grandmother Fern Farnsworth was born on January 19th of 1912 and left us on November 23rd of 2004. She was an important part of my life as she helped raise me since my mother wasn't married when she had me. This occurrence is not that uncommon now but back in the early 60s it was pretty much unheard of. Some of my fondest memories of my Gram was sitting around her kitchen table and playing Canasta. Gram loved Days of Our Lives and every time I hear the theme song it takes me back to her home in Portland. In designing a necklace to honor her I decided to base it on her first name and I found the perfect fern focal at Firefly Design Studio. I also picked up the stunning accent beads at the same place. As an aside I wanted to give the owner Michelle McCarthy huge kudos. My focal arrived broken and as soon as I let Michelle know she sent me out another one. I hope that you have enjoyed my memories and my necklace. There are yet more memories yet to explore so be sure to check out everyone's offerings. Just click here. You and I have now one more thing in common we both call our Grandmother ... Gram. What a beautiful tribute to her. And a stunning necklace. Enjoy the hop. Your post has brought back my own fond memories of playing Canasta with my grandmother and mother. Your grandmother would have been just thrilled with your lovely fern-inspired necklace. What a great tribute, Shai. Loved that your focal embodies your grandmother's first name--what an honor! Beautiful necklace! Gina H.
The necklace is stunning, those beads are just gorgeous. Thank you for sharing your memories. This is a stunning piece, and befitting a woman of uncommon wisdom back then. Shaiha - this is such a wonderful tribute for what seems to have been a wonderful woman. The necklace is unique and beautiful - and so it your memory of her! Gorgeous focal, and so fitting...what a honor to your Grandmother! What a wonderful woman! Beautiful necklace. Beautiful tribute, my daughter's name is Fern too. I love it. Your mother was a strong woman.... I've recently read a couple of books about unwed mothers from that era and they were both amazing and eye-opening. Thanks for being part of my beady family! What a beautiful necklace to honor your grandmother. What a beautiful tribute not only to your grandmother, but to your mom too. Nicely done & love the necklace. It's perfect! Your tribute to your Grandmother is wonderful. My middle name is Fern & also my Aunt's. After my mother-in-law passed away we found out that she had a child in 1948 that on one knew about. Thanx for sharing. What a great idea to use that focal. Aren't grandmothers wonderful? I love the necklace you made. The colours are beautiful and that fern focal is gorgeous. A lovely and very apt tribute to honour your grandmother's memory. Thank you for sharing about her. 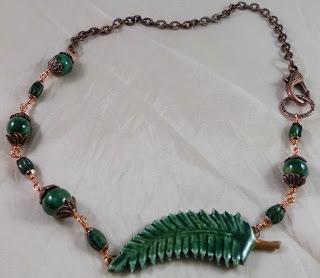 Your necklace is gorgeous, I love the fern focal, it reminds me of my sister, who is a Fern as well. My grandparents taught me how to play cards as well. Cool necklace and cool name. What a wonderful tribute necklace - the fern is perfect! what a beautiful necklace - I love the colors! a beautiful tribute to your Grandmother - I'm sure she would love it!